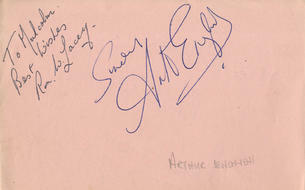 This is an In Person Signed Pink Autograph Album page 6" x 4" by the late English Comedian from the Music Hall tradition. He regularly played the Parts of Spivs and is well known for his role as Mr Harman in Are You Being Served. The page is also signed by Actor Ron Lacey. Leslie Norman English (9 May 1919 - 16 April 1995) was an English actor and comedian from the music hall tradition. English was born in Aldershot, Hampshire. After serving in the army in World War II, reaching the rank of sergeant, English worked as a painter and decorator in his native town. He polished up his comedy routines as an amateur at this time and eventually became resident comedian at the Windmill Theatre in London and did much other stage work. His radio work began with the BBC series Variety Bandbox, using as always his own Aldershot accent. His usual persona was a stereotypical wartime "spiv", and he became known as "The Prince of the Wide Boys". His usual delivery was to tell a long rambling shaggy dog story at ever-increasing rapidity without losing clarity until, at top speed, he would end with the catch-phrase: "Play the music! Open the cage!" Another popular catch-phrase was "Mum. Mum. They're laughing at me!" Arthur English as his 'Spiv' characterHe began to appear on British television in mainly comedy roles in the 1970s, and was noticeable because of his manner and appearance. He is remembered for his character of the truculent and bolshy maintenance man, Mr. Harman, in Are You Being Served? which he played from 1976 to 1985, including the 1977 film adaptation. He played an unsympathetic character in In Sickness and in Health, a follow-up series to Till Death Us Do Part from 1985 to 1990. He also appeared in The Sweeney. He had more likeable roles in two British children's TV series: The Ghosts of Motley Hall, which ran from 1976 to 1978 on ITV (produced by Granada Television), and as 'Slugger' in Follyfoot, which ran from 1971 to 1973, also on ITV (produced by Yorkshire Television). He was in several other films and Everyday Maths (1978), a British TV schools programme starring Jack Wild as English's grandson. In 1985 he appeared in an episode of the American TV series Magnum, P.I.